What Does ESSA Mean For Expanded Learning? We at the Partnership for Children & Youth are very pleased that Congress and the President reached agreement to move past the era of No Child Left Behind, and approve the Every Student Succeeds Act (ESSA) last month. We are particularly pleased that the 21st Century Community Learning Centers (21st CCLC) program has remained a focused funding stream for expanded learning programs, and has received a small funding increase. This program certainly needs to grow to meet the enormous demand, and this is an important step in the right direction. In addition to the funding news, there are several policy changes to the 21st CCLC program that California will have to implement in Federal Fiscal Year 2017, one of the most significant being new flexibility for 21st CCLC funds to be used to support longer school days. Under this new provision, the law makes clear that the funds cannot supplant regular school day activities, that students receive at least 300 hours of additional program hours beyond the regular school day, and that the additional time be carried out with one or more partner entities. We are still analyzing all the changes to 21st CCLC, including some adjustments to how grants are prioritized, which students should be prioritized for enrollment, and potential resources available for technical assistance. We will post more updates as we gather information and clarify the new law’s intent for the various changes. We will also be closely communicating with the California Department of Education as we digest these changes and work collaboratively with our partners and the state to implement new provisions of the law so that we maintain our strong focus on community partnerships and program quality. Please see our recent ESSA Huffington Post blog co-authored with Every Hour Counts, which represents expanded learning intermediaries around the country, and stay tuned for more information in the coming months. Thank you to all of you who took the time in recent months to communicate with Congress about the importance of maintaining the 21st CCLC program, which is a critical resource for children and families across the state of California. Recently, the Office of Career, Technical, and Adult Education (OCTAE) developed an employability skills framework and created a website to assist educators and youth workers with tools to promote these skills in their settings. Laura Rasmussen Foster (RTI International), a leader in developing this framework, shared it with participants at the recent How Kids Learn V conference in Berkeley. Below is a 15-minute video of her presentation. Beyond the Bell at AIR published a paper discussing how the skills cited in the Employability Skills Framework relate to social emotional learning. They gave us permission to cite a portion of this paper. See below. "Although some researchers argue that schools are not doing enough to support the development of the necessary skills for workforce readiness, evidence suggests that we already know a lot about how to develop some of the employability skills outlined in the OCTAE framework—we may just be calling them something else. School-day and afterschool programs across the country have been implementing what are called social and emotional learning (SEL) programs for years. These programs support the development of social and emotional competencies such as problem solving, critical thinking, interpersonal and intrapersonal skills, and social awareness through both explicit SEL instruction (this is more common in school-day settings) and broader SEL strategies and practices (this is more common in afterschool settings). Although not termed as such, the social and emotional skills that these programs target are also key employability skills. 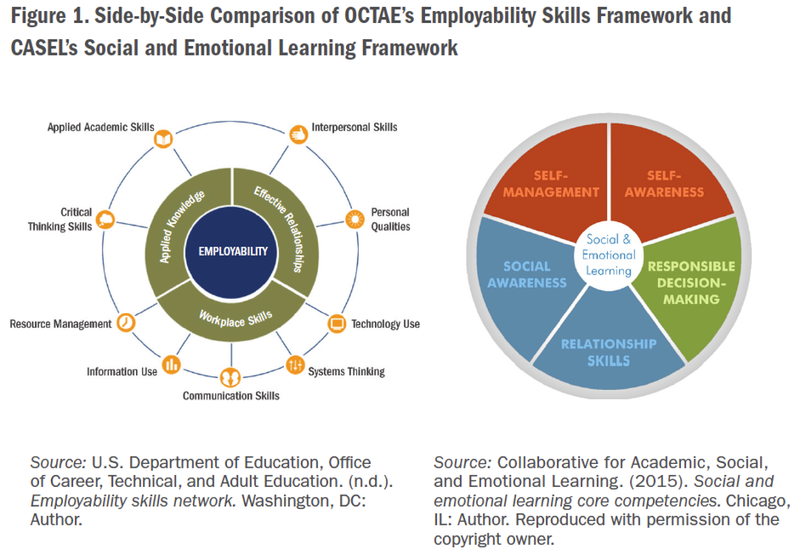 In fact, the framework developed by the Collaborative for Academic, Social, and Emotional Learning (CASEL) bears a strong resemblance to OCTAE’s Employability Skills Framework. Interpersonal skills (OCTAE) and social awareness (CASEL) both require the ability to understand social norms and work with others from diverse backgrounds. Personal qualities (OCTAE) and self-awareness (CASEL) both require the ability to recognize one’s emotions and have a sense of confidence. Communication skills (OCTAE) and relationship skills (CASEL) both require the ability to communicate clearly, listen well, and resolve conflicts. Given these similarities, it makes sense that SEL programs that explicitly target the development of social and emotional competencies could also be considered workforce readiness programs or programs targeting the development of employability skills." You will note that these employability skills and SEL skills (above) are well aligned to the California Quality Standards for Expanded Learning Programs. You can review Beyond the Bell's entire paper by clicking here. 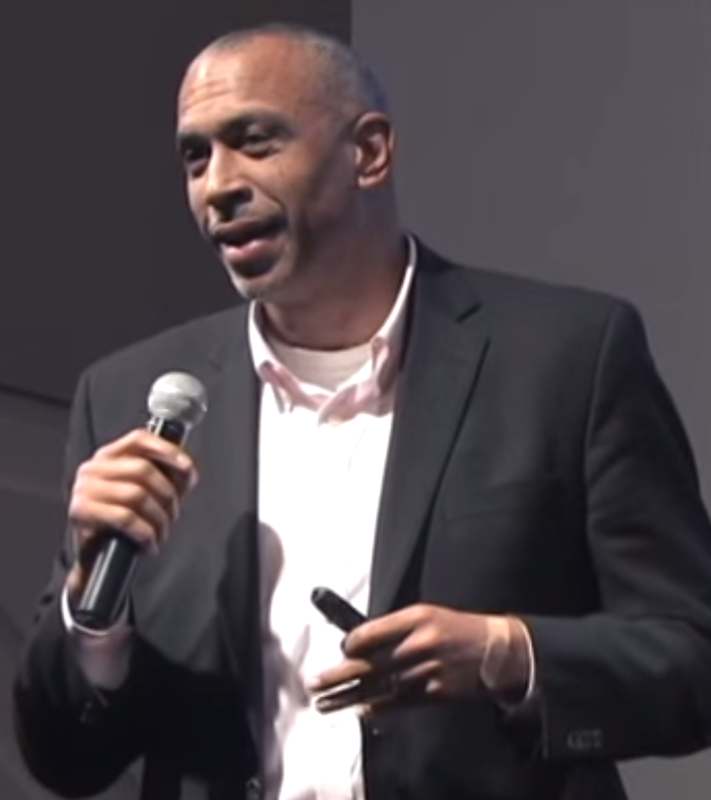 Pedro Noguera is a Distinguished Professor of Education at the Graduate School of Education and Information Sciences at UCLA. Dr. Noguera has been a long time supporter of the LIAS project and the How Kids Learn conferences. He will also be a featured speaker at our upcoming How Kids Learn V conference in Los Angeles on January 21, 2016. Dr. Noguera was recently interviewed by PBS correspondent, Charlayne Hunter-Gault, on the PBS News Hour. The interview was part of their ongoing series entitled “Race Matters”. 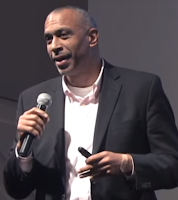 Dr. Noguera addressed the question, “How do we solve stubborn segregation in schools?” Click below to view the interview (8 minutes). You can view an interview that we did with Dr. Noguera on the LIAS learning principles by clicking here. You can also view his last presentation at the How Kids Learn II conference by clicking here. To register for the HKL V conference in Los Angeles, click here. The Partnership for Children and Youth (PCY) has provided important leadership in California and across the country to support the growth of the expanded learning movement. As we begin the new year, we asked Jennifer Peck, Executive Director of PCY, to help us look ahead. Q: In looking ahead to 2016, what do you see as the important emerging trends in expanded learning programs? A: 2016 is going to be a year of even greater opportunity for the expanded learning field in California, given continuing implementation of education, finance, and accountability reform, and the great strides the expanded learning field has made in two critical and related areas: Prioritizing the importance of program quality; and demonstrating to our K-12 partners the real value of our programs in educating young people for successful futures. We have new Quality Standards in California which everyone will play a role in implementing from the state to the site level. We are also implementing a new law which places much greater focus on quality improvement, and there are systems of support all around the state that are responding to the need for training and support for programs in the interest of meeting the Quality Standards. These are critical steps because we know quality matters to student outcomes, and these tools and policy advances support the work of practitioners in this field who are deeply committed to improving the lives of young people. The focus on quality also helps us demonstrate to our school day partners in the K-12 world that expanded learning programs are a necessary and critical component to the task of providing equitable and effective educational opportunities to all young people. With our ability to demonstrate quality and impact, we are better able to firmly assert that without high quality expanded learning opportunities, the education system will never meet its goals of all students achieving success in school, higher education, and career. In 2016, we will capitalize on the great strides we have made in building relationships with our partners in the K-12 world such as school administrators, school board members, teachers and other leaders at the state and local levels by demonstrating how our programs keep students engaged, support Common Core skills, support Social and Emotional Learning skills, and much more. Q: Looking ahead to 2016, what do you see as the most significant challenge facing the field of expanded learning? A: Our biggest challenge by far is grappling with the financing crisis our state funded programs are facing. The state set a daily per child, per day rate of $7.50 back in 2006, and despite enormous cost of living increases and more recent increases in the state minimum wage, that daily rate remains stagnant and programs are suffering. While program providers do everything they can to stay afloat and maintain services for students, they can only stretch so far. In 2015, many programs reported the need to eliminate some professional development, eliminate some enrichment services, and eliminate full time site coordinators. In 2016, we may begin to see some programs have to shut their doors. In response, last winter our advocacy community came together and rapidly put together a bill and a budget request for our state legislature which was very successful – the legislature recommended a $25 million increase to ASES. However, the Governor was not convinced this was a priority and did not include this in his final budget. We are now gearing up for an even bigger effort in 2016 to secure additional resources for ASES so our programs can survive and thrive into the future. This Campaign to preserve California’s investment and leadership in expanded learning needs to be a priority for everyone who cares about this work – see the Campaign’s brand new website to learn how to get involved at www.saveafterschool.com.